…if Alvie Brechenmacher and her mentor can outwit a dangerous rival. Alvie is apprentice to Marion Praff, a world-famous inventor/magician. Both are driven to find novel applications in the new field of Polymaking. Shortly after beginning her apprenticeship, Alvie makes a new friend who inspires her to use Polymaking to solve her friend’s medical problem. While she’s working on the solution, can Alvie discover what her own heart desires? Charlie N. Holmberg is at her original best blending magic, science, and steampunk for a unique magic system. Holmberg excels at satisfactorily twisty mysteries, character-driven stories, and compelling world- and character-building. 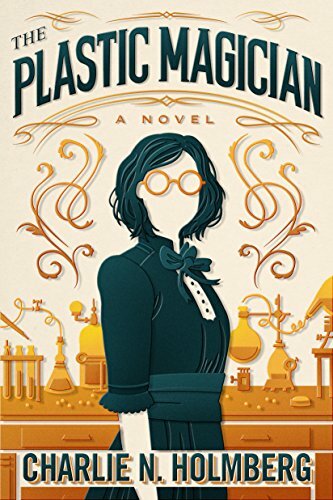 The Plastic Magician is a great addition to the world of The Paper Magician with a few characters crossing over in support roles, so this book can easily be read as a standalone novel. While the storylines were all wrapped up, there was one magical aspect that was left partially solved which could lead to additional stories with Alvie.